With each passing film, it regrettably is becoming more evident that District 9 seems to be the possible exception for writer/director Neill Blomkamp. It seemed like a new visionary had broken through who could meld heady themes with rousing sci-fi spectacle, a champion of both the visceral pleasures of genre movies and the satisfaction of narrative complexity. After two more films under his belt and with complete creative control, it’s starting to look like Blomkamp’s sense of storytelling is a bit more limited than District 9 would have lead on. The man is excellent at putting together concepts, and he likes to delve into major themes and messages, but the execution has been hobbled and the themes are simplistic to the point of being childish. Perhaps the man is suffering from unrealistic expectations or perhaps the greater world is finally seeing that Blomkamp has been remaking the same movie over and over with diminishing results each time. If you disliked 2013’s Elysium, you’ll probably have an even lesser opinion on Chappie. In the near future, Johannesburg, South Africa is being policed by a series of rabbit-like robotic “scouts” created by Deon (Dev Patel). His boss (Sigourney Weaver) is happy with the results but very wary of Deon’s interest in artificial intelligence. Deon takes an old robot and installs his A.I. program, giving it sentience. But before he can marvel at his newest creation, a pair of grimy criminals, Yolandi and Ninja, kidnaps him. They dub the new sentient robot Chappie (Sharlto Copley) and plan on making use of him for a heist. Deon strongly disapproves, promising to come back so he can nurture Chappie’s creativity. Yolandi becomes “Mommy” who wants to encourage the robot’s sensitivity, Ninja becomes “Daddy” and wants to toughen him up, and Deon the absent father figure. At work, Deon’s rival inventor, Vincent (Hugh Jackman), is anxious for any opportunity to promote his own police force, a giant flying mech warrior known as the Moose. Unlike Deon’s robotic scouts, a human operator controls the Moose. 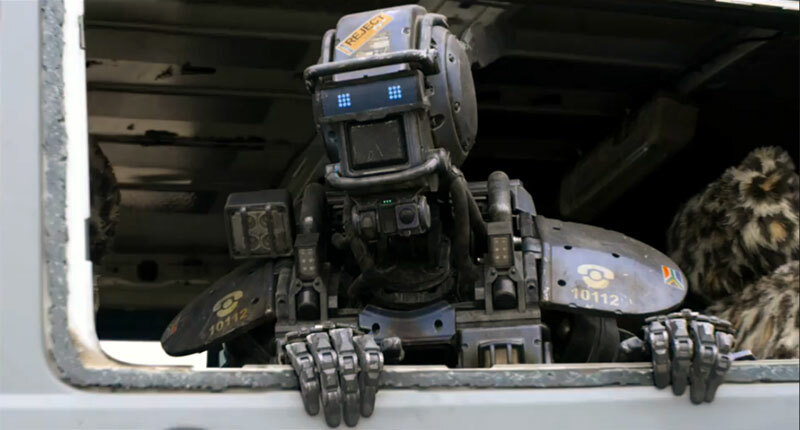 Discovering Chappie is exactly what Vincent has been waiting for to destroy his competition. Chappie is a tonally inconsistent mess that ends up being a weird, garish, and unsatisfying hybrid between Robocop and Short Circuit. It jumps around from being a slapstick comedy, a sentimental unconventional family, an urban warfare action thriller, and a science fiction film exploring the possibilities of artificial intelligence. The tonal shifts can be quite jarring; one moment the movie wants you to feel sorry for Chappie getting beaten (he’s a helpless robot!) by a group of hoodlums (why does a robot fear pain anyway? ), and the next moment Blomkamp wants you to laugh at the trashy gangster shenanigans. If the film could ever settle on one tone and take the time to develop it properly, Chappie might have been salvageable. Of course this assumes that Blomkamp restrains himself from explaining everything to his audience. He’s not exactly a subtle filmmaking when it comes to his deeper allegories even with District 9, but it just gets insulting how little faith he has with an audience, bludgeoning them silly. At one point, “Mommy” reads Chappie a bedtime story and it’s about the black sheep, the outcast, and just from that alone, we get the thematic connection. That’s not enough. Blomkamp has “Mommy” explain the thematic significance. Okay, fine, now he’s made the message explicit but even that’s not enough. “Mommy” then literally points to Chappie and says, in case anyone still wasn’t getting it, that he is the black sheep. It’s an illusion of greater intellectual depth that unravels as the film chaotically continues. Let’s get to the biggest problems with the film: Chappie and his would-be adoptive parents are annoying. While Chappie is a technically impressive visual effect with a motion-capture performance by Blomkamp staple Sharlto Copley, the character is far less winsome. Why would a robot be acting like a child? It’s because Blomkamp wants to rely upon easy sentiment and emotional manipulation to get you to feel for his characters when the story alone is incapable of achieving this. Chappie as a personality is something of a blank slate, and this is filled by the trashy gangster wisdom of Yolandi and Ninja played by South African rap duo Die Antwoord. They’re pretty much playing themselves, credited as their stage names, they wear their own merchandise, and their exaggerated, beyond-ironic-back-to-pseudo-reverent garish style is off-putting in large doses. THEY’RE THE MAIN CHARACTERS. That’s right, two non-actors who plays themselves are the main characters. The movie relies on many Die Antwoord tunes to highlight its sense of funky nihilism. As performers, I’ll admit that there is something unique to them, but it’s foolish to give them a whole movie to carry. It feels like Blomkamp took the profane comic relief characters from another movie and said, “Hey, what would it be like to stretch them out for a whole movie and raise a kid?” Either you find a “gangster talking” robot with gold chains hilarious or you don’t. The world of Blomkamp seems like it’s stuck on repeat, setting his futuristic steam punk tales in the slums of South Africa, but is this location really integral to tell Chappie? It was essential to District 9 because that movie was an allegory about the apartheid, but none of that specific history of culture plays into this movie in any meaningful sense. The setting then becomes inconsequential, though I could level the same charge at the overwhelming movies set in New York or Los Angeles. The world building of Chappie, like much of its narrative elements, feels half-hearted and curiously rendered. Yolandi and Ninja are threatened with seven days to pay off their debt, but you never feel like there’s a sense of urgency, as if the movie would prefer you forget about this ticking clock. This secondary bad guy seems to be the source of all crime in Johannesburg. Deon has created a widespread police force and yet it never feels like the other characters treat this with the magnitude it warrants. Likewise, Deon doesn’t seem to treat artificial intelligence as a big deal. Then again his boss, of a huge robotics corporation I want to emphasize, has to have artificial intelligence explained to her (again, Blomkamp of little faith). There’s also the way the movie is mired in weird office politics. Vincent is jealous that another program was successful and makes his program look bad, so he works to sabotage Deon’s robots so his project will get the go ahead. Vincent’s project is a glaringly obvious rip-off of the ED-209 from Robocop. It seems so strangely isolated, as if Vincent never thought about selling a flying mobile tank to the lucrative military. The most outlandish moment in the movie might be when Vincent points a gun to Deon’s head, threatens him, all within full view of a slew of co-workers, and then sheepishly retreats with the excuse, “It’s not loaded. Just a joke, mate.” How does this guy still have a job? Is the human resources department of the future replaced with robots as well? Here are a small number of other directions Chappie could have gone that I think would be more compelling than what we get, and these just came to me during the movie. Instead of having the robot officers being responsibly used, why not have the world as a police state overrun by these sentinels, an oppressive regime worth toppling. Then Chappie ends up being a robot that’s captured, reprogrammed by revolutionaries, and fights against his programming for what he believes is truly right. Isn’t that a better setting, and far more topical with the current militarization of police forces dominating news? This scenario is better than a work force of robots that most characters shrug over. Then there’s Vincent’s plot to sabotage the robotic scouts (mild spoilers). Instead of just turning the robots off and letting chaos reign, wouldn’t it be a far better angle for him to turn the robots against the civilian populace? Instead of broken robots we have killer robots. Again, it adds a greater sense of urgency but also a route that would seem far more in keeping with the nature of Vincent. Chappie is filled with these hypothetical plot detours you see in your head and wish the film had taken. The movie that Blomkamp delivers is a profane fairy tale that teases a greater experience that fails to materialize. Chappie is one of those movies you sit and keep hoping it’s going to turn a corner, to get better, to finally capitalize on the setups its been throwing around, to coalesce tonally and magically reveal the madness behind its sloppy methods. Unfortunately, it just remains a disappointing film that feels like several revisions away from proper execution. The plot elements don’t come together. Worst, Blomkamp cannot trust his audience to get even the simplistic metaphors on display. It’s two movies in a row where Blomkamp has miffed on his story. His sense of visuals is unmistakable, and he sure knows how to fill his movies with cool stuff. I imagine his pitch sessions are great with studio execs. It’s just now becoming more apparent that his major shortcoming comes to realizing these stories. 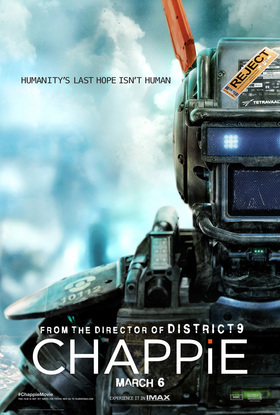 There’s a host of other miscues with Chappie. I’m going to go out on a limb and say you’ll never be seeing Die Antwoord as the lead actors in another movie again. Maybe Blomkamp hired them just to get a discount on playing their music throughout the movie. Blomkamp has recently been hired to direct an Alien sequel, and I hope he takes full advantage of this opportunity to creatively leave behind his old stomping grounds. Otherwise in space, no one can hear you yawn. Posted on March 9, 2015, in 2015 Movies and tagged action, drama, neill blomkamp, robots, sci-fi, sharlto copley. Bookmark the permalink. 1 Comment. A very weird movie. I’ll admit to that. But it always kept my attention and never seemed like it was really going anywhere that I’ve seen before. Even if some of the devices did seem, yes, familiar. Good review Nate.